Volunteering with animals is a great way to make a difference and give something back, but it doesn’t stop there! Turns out, thanks to a new study linking volunteering to longevity, there may be more reasons to muck in at one of your local animal shelters. So apart from feeling all warm and fuzzy inside knowing that you’re doing a good thing, you can also take comfort in the knowledge that you’ll live longer than those who’ve never volunteered. According to a recent study published in BMC Public Health, researchers found that those who volunteer and regularly help out in their community were 20% less likely to die prematurely. With that in mind, why aren’t you signing up to get involved with your favorite animal charity already? After examining 40 different academic papers from the past 20 years and studying the links between volunteering and health, Dr. Suzanna Richards and her team discovered that helping others is directly associated with a positive effect on mental health, reduced depression and increased well-being. It’s not hard to see how helping out those in need can have such a positive reciprocal effect. Apart from the fact that any physical activity is good for our body and mind, volunteering allows us to develop deep and heartfelt social connections that bond us to one another and in turn causes the release of the hormone oxytocin, which blunts stress and increases feelings of love and empathy. Additionally, volunteering also provides us with a sense of happiness and life satisfaction, two things that have been proven to increase lifespan time & time again. There are a whole host of incredible health benefits from getting up close and personal with the animal kingdom, and when you team the two together, you end up with one powerful combination. Studies examining the interactions between humans and animals show similar results when it comes to the hormone oxytocin, and specifically how the bonds we share with animals are woven from the same stuff that merges mothers and infants, and that’s just the start of it. Oxytocin is very beneficial for us. It increases feelings of happiness and trust, and has a powerful effect on the body’s ability to heal, and even to grow new cells. Growing research shows that the value of human-animal bonding can play a crucial role in child development elderly care, dementia, mental illness, abuse and trauma recovery, physical impairment, and the rehabilitation of incarcerated youths & adults. Spending time with animals is therapeutic in so many ways, from relationship building to mood boosting and just about everything in between. The significance of human-animal relationships is underestimated, but once discovered, can help you to live a much fuller, healthier and happier life. 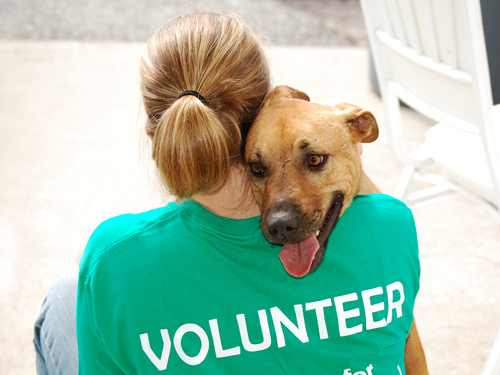 Have you ever volunteered with animals? Shelter Dog Shines as Search & Rescue Dog!